Dicerothamnus rhinocerotis (L.f.) Koekemoer (invalidly published), Elytropappus cernuus (Thunb.) Fourc., Seriphium adpressum DC., Stoebe cernua Thunb., Stoebe cupressina Rchb., Stoebe rhinocerotis L.f. Widespread, extremely common and not declining. Southern Namibia to the Cape Peninsula and eastwards across the Western and Eastern Cape as far as East London. Arid shale and sandstone slopes and flats. 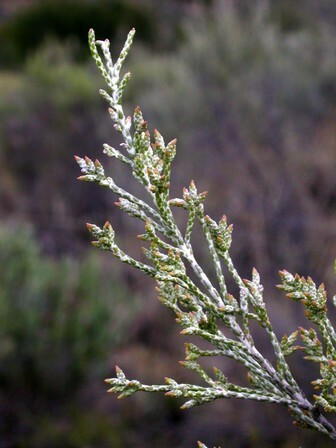 An extremely common species, often dominating fynbos communities, especially under disturbance. POSA/PRECIS name = Dicerothamnus rhinocerotis (L.f.) Koekemoer (unpublished new combination).